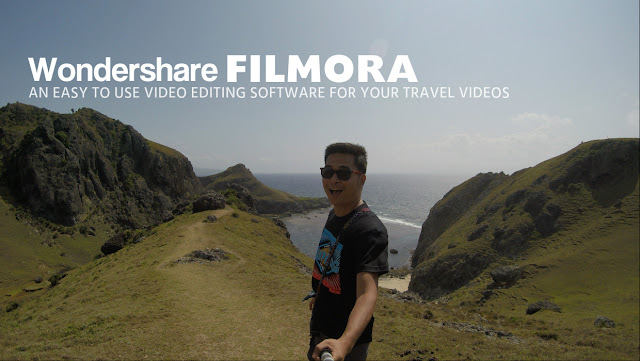 REVIEW: Wondershare Filmora, "An Easy to Use Video Editing Software for your Travel Videos"
Creating videos is one awesome way to share your travels and adventures. I must admit that I am not comfortable using videos in my blog. Why? Because it takes too much time and effort to edit and create a video. That is why, I am so happy when I was introduced to this amazing video editing software called Wondershare Filmora. Wondershare Filmora is an easy to use video editing software that lets you create and share videos in just a few steps. Filmora makes it incredibly easy yet to allow users to create highly engaging videos in munities. It’s a video editor which shouldn't be missed by video creators & vloggers, especially for those who are just beginning to learn how to create videos – just like me. If you don't have the software installed in in your laptop, you may download the trial version of the Wondershare Filmora software here. After installing it in your computer, launch the software and you can now use the trial version. In creating a new video, you have two options. First, you can edit and create a new video using the Easy Mode and second, using the Full Feature Mode. You can also choose the aspect ratio of your video by clicking 4:3 or 16:9 for your new video project. Now, let's start creating a video using “Easy Mode” which involves 5 simple steps. This mode is useful when you just want to stitch videos or create a photo collage of your travels. Import the videos and photos you want to add in your new video project. Next step is selecting the theme you want to use for your new video project. Here, you can choose from the 6 built-in themes in the Filmora Software such as Simple, Happy, Sport, Love, Travel or Old Days. Depending on the video you are creating, selecting a theme will give more character in your new video project. You may also see how it looks like by clicking the preview video on the right side. The 3rd step is selecting the background music for your video. There are several preset music from Filmora’s music library to choose from or you may also choose to add your own music from your computer. The next step is to preview your video. Here, you can also add opening and closing titles for your video. The final step is saving your video. Here you can choose the video format, where to save it and some settings for your output video. Video settings can also be adjusted to your preferred video quality as well as some video and audio settings. Click export and wait until Filmora is done creating your video. Here’s a video I created using Filmora’s easy mode. Wondershare Filmora’s “Full Feature Mode” is more useful if you want to have better control your new video project. It is also easy to use. Just add the media you want to include in your video prjects, add a background music from Filmora's music library or you may also opt to import your own music and add text, filters, overlays, elements and transitions in your video. With this mode, you can also edit the videos, adjust the video speed as well as using split screens by selecting several split screens from from Filmora's predefined spilt screen library. What I like most about the full feature mode is the option to edit your video. To edit, just right click the video or click edit in the task bar and choose edit. In the edit mode, you can flip or rotate the video, adjust video contrast, saturation, brightness, hue and video speed. You can even auto enhance or play the video in reverse with just one click! Awesome!!! Audio can also be adjusted in the edit mode. You can adjust the video's volume, pitch, set equalizer or denoise by removing the background noise. More to that, it is also capable of setting the fade in or fade out of the background music. How cool is that?! Adding text to your video is so easy. Just click the Text/Credit and choose from the many predefined text from Filmora. After choosing your preferred text, click on the text and edit with your own text. You may also edit the font face, size, type, alignment, color, and line/ letter spacing. Adding filters and overlays give you more creative possibilities for your movie. I love that Filmora has several filters and overlays that you can use in your video project. After editing your video, just click export and choose the video format, where to save it and set some setting for your output video. Click export and wait until Filmora finish creating your video. Here’s the video I created using the Full Feature Mode of Wondershare Filmora. Wondershare Filmora is definitely one of the best video editing software I’ve used. It's easy to use, uncomplicated and ideal for those who are just starting to learn editing videos. With Wondershare Filmora software, I can now showcase the best of the places I'm visiting in a more engaging and entertaining way. Try the Wondershare Filmora software and show your creativity with your family, friends and the rest of the world! If you loved how easy and convenient to edit videos using Filmora, you may choose to purchase the software license to enjoy the software’s full features. Here are the different license packages to choose from. Click here to buy a license. After purchasing the product license, Filmora will email you with a Registration code that you will input to register your software. With a registered software, you can export and share videos without a watermark, free one-to-one technical support and free product updates. Enjoy Wonderhare Filmora’s awesome video editing features. Download, buy and register your software. I’m happy that I have the full licensed version. I’m certainly loving it and will definitely share more videos of my travels and adventures in my blog, soon!